Little is known about the childhood and education of Ellen Louis Herndon, but she is said to have had a beautiful contralto singing voice, and she had a career as a singer of some renown. She met attorney Chester A. Arthur when she was 19, they married on the eve of the Civil War, and in their twenty years together they had three children, one of whom died in infancy. In January of 1880 she sang at a fundraising event, and caught what she thought was a cold while waiting for her carriage after the performance. It was pneumonia, and three days later she was dead. 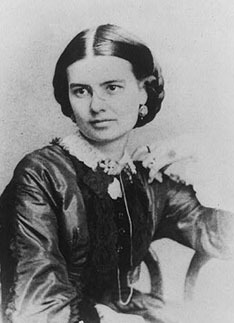 Her husband, who never remarried, was later elected Vice Presidency under James Garfield, and became President when Garfield was assassinated. Chester Arthur asked his sister, Mary McElroy, to perform the social duties of America's First Lady. Ellen Arthur's father was the explorer William Lewis Herndon, who charted the valley of the Amazon River under the order of President Millard Fillmore. Four years later, commanding the USS Central America, his ship was caught in a hurricane, and Captain Herndon oversaw the rescue of 152 of his crew and passengers, before going down with his ship off Cape Hatteras. Two US Navy ships and the town of Herndon, Virginia have been named in his honor.